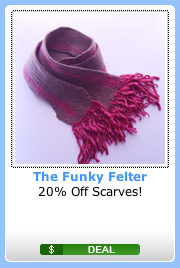 The Funky Felter: Find Great Holiday Shopping Deals at IndieContests.com - super handmade and handcrafted items at a discount! Find Great Holiday Shopping Deals at IndieContests.com - super handmade and handcrafted items at a discount! I've known about this great site for a while now. It is an offspring from the wonderful IndiePublic.com, a social networking site for artists, crafters, and all things indie. (You can check out my personal IndiePublic profile here.) IndieContests.com allows a way for small business artists and crafters to post contests and deals. It is a really great concept, and a terrific place to find some discounts when you're Holiday shopping! The individual artist or crafter can set their deal or contest. It is then posted along with all the needed information like the site url and promo code to redeem the set discount at purchase. Each shop can choose their particular discount or contest terms. I just set a great deal up that started yesterday (November 1st) and will last through November 15th. I'm offering 20% off my hand felted wool scarves. You can check out all the details here and get the necessary promo code to redeem the discount. I also recommend that you check out the site for more super deals and buy handmade this Holiday season (at a discount too).